The first release from prog/space/psych CD distributor Cranium Music's new label presents fellow New Zealanders Moby Trip. Consisting of Ray Stroud on bass and vocals, John Stroud on guitar and vocals (he also did the cool cover painting), and Anthony Van der Putten on drums, the band plays raw, acid-drenched, late 60's/early 70's influenced power-trio jam rock. For their debut, the band has released a performance recorded live in November '97, and given the nature of the music this may well have been a wise choice. Freaks for extended guitar stretch out jams, and all the accompanying effects (plenty of echo, fuzz, and wah-wah!) will drool over this disc. John Stroud's guitar style is - to my ears - a mixture of Hendrix and Roye Albrighton. I've long argued that Nektar's "Sounds Like This" was the best jam rock album of the 70's, and "NKU" is one of the better representations of this tradition I've heard in the 90's. Just crank this up, close your eyes, and you'll be transported back to the Fillmore of days past. The directness of the Hendrix influence is most apparent on "Catch Up", "America", and "Floating", the numbers on which guitarist John handles the vocal duties. These sound like long lost Hendrix tracks and John seems to intentionally imitate the deceased master's singing voice. The entire disc, however, isn't relentless instrumental fury. The three part opening track, "Hey Jonah/Vur Immer" starts and finishes with trippy synths and even has a short piano part. "Gnaw People" is one of the more overtly lysergic tracks and features an interesting blend of Santana-like bass/drum rhythms with John's guitar blasting uncontrollably into the cosmos. And the closing track, "Visitations", is a dreamy ambient piece that serves as a slow, smooth landing after an hour of rockin' bliss. In summary, Moby Trip's "NKU" will appeal to anyone who loves raw, guitar dominated jam rock. Some may call this sound dated, but my feeling is that any improv-based music that is coherent, and feels this good, is as fresh as it ever was. Moby Trip proves that raw and primitive can be as beautiful as a symphony. A short email interview with John and Ray Stroud was facilitated for Aural Innovations by Cranium Music's Richard Stockwell. AI: How did you get into playing this style of music? That is, did you discover it at some point or have you been jamming away since the days of the New Zealand Fillmore? RS: Being middle aged, I have been aware of it since its inception in the late 60's when I played in local Wellington and Porirua bands covering Yardbirds, Hendrix and Pink Floyd material, etc. There was a healthy music scene there and a lot of excellent bands playing original material mixed with covers of overseas prog rock type bands. Kiwi bands like Space Farm, Human Instinct and The Underdogs were just the tip of the iceberg. The scene faded here as it did overseas. For me interest in the musical style, however, has never faded. JS: I have always been aware of it through my father's (Ray's) music collection, and when the opportunity arose to create and perform it for the Cranium Music Show it was a pleasure to do it as there were no constraining boundaries. AI: How long have you been playing together as Moby Trip? RS: Moby Trip has performed twice. First at the Cranium Music Show, and secondly at the Carlton Theatre to an audience of four, which we recorded. We created the music in one month prior to the Cranium Music Show. As a band, however, we have played hard nosed R'n'B music together for twelve years now under the name of Johnny and the Phantoms, averaging three four hour gigs a week in bars all over the country. We make a modest living at this. Tony and I go back further, and played in a rock band in the 70's. AI: Though your style is classic raw jam rock and has a great improvisational feel, I detect no mindless instrumental meandering. The music explores, but there's a sense of controlled development. Do your songs evolve out of initial jams and go through some process of refining? RS: Because of our professional background as musicians, we have developed a very disciplined rehearsal attitude. Our original songs are presented to the band in a workable format. For example, words and chord structures are already in place. The band responds quickly to what the writer wants. We haven't really experimented much in rehearsals with jamming. This is something that takes place on stage. As Moby Trip evolves this method could change. JS: One advantage in being a three piece unit is that we can put ideas together quickly on tape. I then take the tape home and nut out things to add to it. I can jam to my hearts content and I don't waste anyone's time. Using this method we can complete a batch of songs over two or three practices. This is how the songs for the album were created within one month. Lengths of improvisation, or course, will vary as a song evolves, but, generally speaking, there is a controlled development. AI: I felt that recording this CD live was a good move for this style of music. Was it your feeling that Moby Trip's music could best be communicated in a live setting even on CD? JS: Yes, I prefer live playing as well. I find it leaves room for improvisation if required, which you can't reproduce in a controlled studio environment. AI: Is this your first recording? RS: As Moby Trip, it is our first recording. We have recorded several albums with our other band. JS: For this recording, however, it is the first time we've had our hands on the dials. Although not perfect, the sound is closer to what we wanted, as opposed to frustrations with sound engineers we've suffered in the past. Sound production can only improve from this point. AI: The synths add a wonderfully trippy quality to the music. And "Visitations" was a very pleasant surprise ending. The electronics add a texture to the music that, to this listener, sets you just a bit apart from others in this mold. JS: Having played three piece for years now I find the additional instrument adds a more solid base, and opens up more musical possibilities. It is difficult to coordinate our improvised sound with a programmed synth. I won't be programming synth for the next album. I think the answer is in taking on board a synth player to add live texture to the sound and develop the improvisation further. "Visitations" wasn't recorded live. I recorded that on an old four track at home and we put it on the end of the album as a wind down track. RS: Yes, I agree, we need a synth player. I really felt a bit foolish playing along with a programmed sound. I will never do that again. It feels too much like karaoke. I think a synth player rather than a classically trained keyboardist would suit us better as we are not really interested in that technical pompous sound. We go more for texture. Keyboards are an asset, but we wouldn't employ them or any other instrument just to set ourselves apart. It either sounds right or it doesn't. AI: Do you get to play live often? Tell me a bit about the live scene in your town. Are people amenable to space, psych, prog, etc? RS: As we mentioned before, we play every week with our other band. The live scene in our town is poor, mainly discos and top 40 garbage being peddled to an uninformed public. Radio, TV, and CD shops are generally not supportive of anything else. New Zealand has a small population with no local content quota on air, and to keep playing professionally we have to keep moving around all over the country. Space, psych, prog, etc, is not big here and we can only hope to improve that situation by somehow infilitrating the media. It's early days yet. 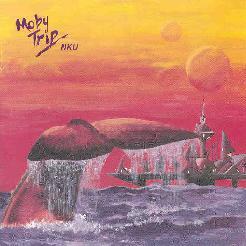 For more information about Moby Trip, visit the Cranium Music web site.